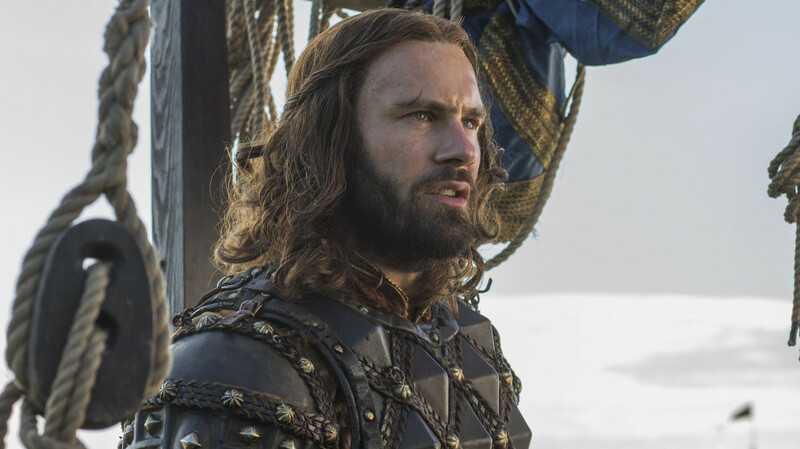 When Nerds Attack was lucky enough to talk to Clive Standen about his upcoming return to History Channel’s Vikings as Rollo, King of France, brother to the now-dead Ragnar, and uncle to Ivar and Bjorn. When Nerds Attack (WNA): What was it like being back on the set with everybody again? Since you’ve been on that set, quite a few of the people you used to work with have moved on. Clive Standen: It was nice, because while it had been a long time since Rollo had been back, it was also a long time since Clive had been back. The first scene I filmed was going back into the great hall with Ivar and King Harald; I had masses of soldiers around me and it really was a big spectacle. The trumpets, pomp and grace– it was like I hadn’t been away. It was amazing as well, seeing all the crew members that I had been working with for six years. But then it was weird going into the Great Hall and not being the brother of the King; Ragnar wasn’t there, and Lagertha wasn’t there. It’s a group of actors who have only been really filming for one season previously, so in some ways I’m the old dog. It was very much about us actors feeling eachother out, just as the characters were trying to feel eachother out. Later on, without giving anything away, I was able to work again with two of the actors that have been around since the very beginning– Bjorn and Lagertha. It was like I’d never been away. Over those years, we’ve become pretty much a tight knit bunch of eclectic morons– we’re different, but when we put it all together, we’re a powerhouse. It’s a very special set, Vikings— the actors do amazing work and create amazing energy, but the crew have been together for years prior– they worked together on Tudors. We’re just a well oiled machine, so coming back was pretty easy to be accepted into the fold again. WNA: Leading off that, it has been a long time since Rollo has been home. The last time we saw him, he was getting yelled at by his wife back in France. Can you talk a little bit about his mindset right now, and how it was coming back into Rollo, in the midst of the show’s current conflict? Standen: Every season we try and reinvent Rollo. You always expect the unexpected with him. He surprises you; just as you think you know who he is, I try to find a few more layers and transform him. He is a character that trips and stumbles all the time, but every time he stumbles, he gets back up and learns something from it– and comes back stronger. At this point, he’s a lot older and he’s dealing with his own mortality now. I brought in a little bit of my own gusto into the scenes; I told Michael [Hirst, showrunner] I wanted to have a little elixir of medicine, some sort of tonic that would insinuate that something is rotten in the state of Denmark, as Hamlet says. I wanted to just show that this man is starting to hedge his bets on where he’s going in the afterlife. Rollo’s started to question his own mortality: are the Gods [he’s] grown up with most of his life going still accept him into Valhalla after the things he’s done? He’s also quite happy currently, being the leader of the Francia people, and he’s accepted their God as well. It may be a means to an end, but he goes to church and he’s embraced that God– is he going to end up in Heaven? Is he going to end up in Hell? Or is he going to be cursed to walk in purgatory? All these things are going round in his mind, and I think they do go into a lot of our heads as we start to get on and start to question things. He also comes back to deal with what’s right for his people. He’s a ruler of the Francian people; he’s the Duke of Normandy, and he has to think about what’s best for [France], so supporting Ivar in battle is quite a strong position to take. But it also gives him the chance to come back and open some of his old wounds and hopefully find some respite from the characters he needs to speak to– I think that’s the real reason he comes home. 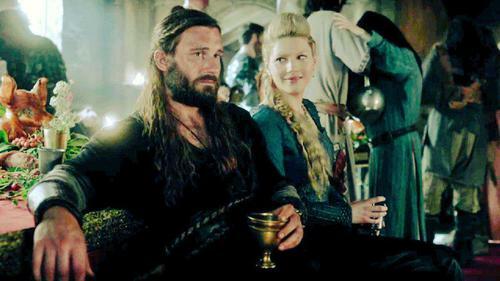 Rollo sent in the boats at the end of the first half of season five– that was the politics. Now this gives him the opportunity to face his nephew, Ivar, face to face. This is a boy who has been the runt of the family, he’s been crippled. He was almost written off by Ragnar, and most of his brothers gave him a very hard time when they were children. It mirrors Rollo’s life in many ways. Rollo lived in the shadow of his legendary older brother, so there is a lot that Rollo can teach Ivar. I think that’s what’s interesting to me. He comes back to help Ivar, but he also has an underlying notion to kind of almost put right what he’s put wrong. To readdress Bjorn, Lagertha, and the people of Kattegat… and maybe try and kind of get some kind of closure on some things that have been weighing on his mind. WNA: I’ve always seen Rollo’s journey as someone trying to find their own place in the world, and he’s struggled more than most on the show. He fails often, but picks himself up. Of course, he does that often by playing both sides–something we see him doing in the first episode of this back-half of the season. Can you talk a little about his confrontation with Bjorn and Lagertha, and how he has to deal with their feelings of betrayal? Standen: I think it’s one of those things where Rollo knows what he’s accomplished, and he’s left some people behind. I’m reminded of the end of Season three when Bjorn asks any of the Vikings if they want to stay and winter on the Seine, and Rollo is the first to suggest he stay. Bjorn is curious why, and Rollo says there’s nothing left for him back home– but he doesn’t believe that, and it’s not true. The only thing back at home for him is Bjorn, who he’s brought up like his own child. 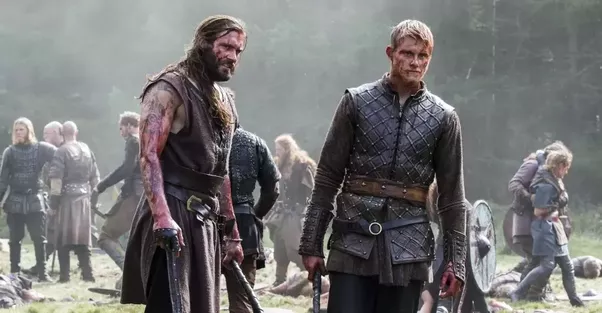 If we look back to Season one, when Ragnar was lost in his own narcissism and rising through the ranks of Viking society, Rollo was quite a stable person. Even the battle in Paris when Bjorn is shot with a crossbow, and we think he’s pretty much on death’s door, Ragnar is too concerned about attacking and not retreating. However, Rollo storms into that tent and takes on the fatherly role. I think now more than ever that Ragnar is gone, Rollo feels a need to give Bjorn some information. But as we all know, just because we feel a certain way, doesn’t mean others are going to agree with it. I don’t know how much I have to speak in riddles, but with Lagertha as well, it’s something that started from the very first episode we filmed. We had a brilliant director, Johan Frank (who I liken to Ingmar Bergman); he was such an amazing director, who was interested in the subtext of a scene, and what wasn’t being said. There was a particular scene where Ragnar goes outside to relieve himself, and Lagertha and Rollo are left alone. We did multiple takes, and Frank would take an actor to one side and just whisper things like, “you care more about that person than you’re letting on,” or something of the kind, to try and get a different performance every time. But there was one particular thing he whispered into my ear that became a constant, and when I mentioned it to Michael Hirst, it was clear that Michael had actually had the same idea. It was something that boiled under the surface, after season after season, and it is now coming to fruition. Now in this episode there’s going to be a scene between Lagertha and Rollo that is a culmination of all of that. This is something that I’ve kept in my thoughts, and it didn’t matter if many (or any) picked up on the subtext; it stayed with me in my characterization of Rollo from day one. So it’s nice to actually go full circle and actually play it through speech, rather than just playing as a subtext. WNA: Well it’s been a joy to speak with you; Rollo is one of my favorites, and I was so happy to see you come back for this episode. Hopefully you’ll be able to come back for more, later. Standen: Well they’re filming Season 6, so maybe he’ll come back again–I keep teasing Michael Hirst that I should get to return! Rollo went away as his storyline was very much entwined with Ragnar’s. Once things moved onto Ragnar’s sons and the golden age of Vikings, it needed to stay centered in Scandinavia–it couldn’t be bouncing back to France all the time. But as we did this time, I’m sure there is a way to bring Rollo back without feeling like we’re bastardizing history, or doing disservice to the character, or the show. Tune into the History Channel November 28th to see the return of Rollo and the rest of the Vikings at 9/10pm!